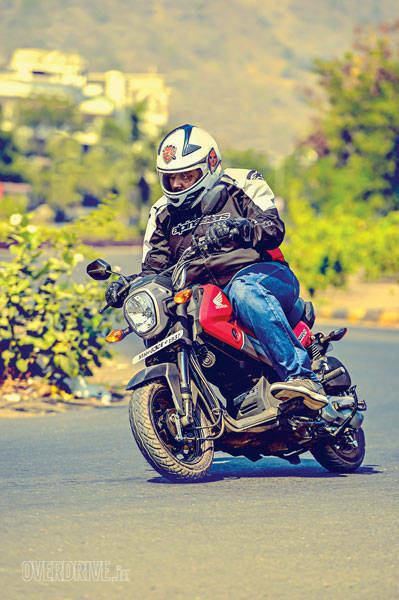 The first thought that came to my mind on seeing the Honda Navi was that finally there is something to scoot about on without compromising on the joy of riding. Weighing 7kg less than the Activa, on which it is based, the Navi might be the ideal city zipper on paper. er, large...er, healthy guy wants to ride the Honda Navi too? The thought is amusing no? Especially if this mouldbreaker weighs 500kg, right? Meanies. But should having fun be the sole preserve of those who can see their feet? To find an answer to that, I decided to ride the Honda Navi around the busy streets of Mumbai. Challenges and difficulties were plenty, but there was a point to be proven. And giving me company was my scooter disliking 800-feet-tall colleague, Lijo, riding the iconic Activa. He cannot see his feet either - they're too far away from his head. 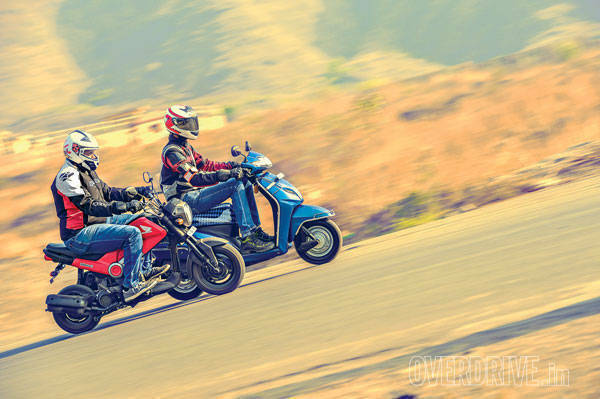 This is a story of how two men of different sizes overcame many hardships, toiled hard and fought the deeply entrenched idea that one has to be in shape to enjoy two-wheelers. Stomach in, chest out, riding gear on and off we go. Is the Honda Navi a motorcycle or a scooter? 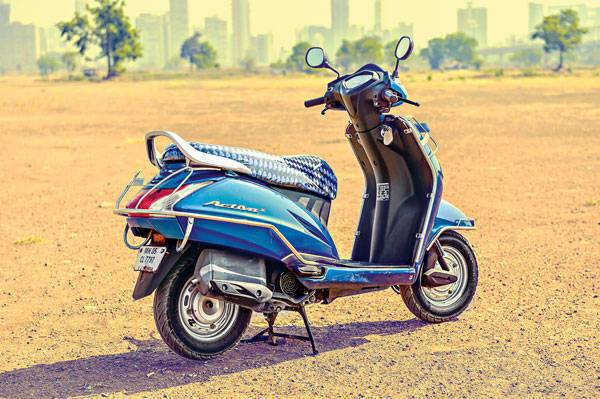 It is small and has tiny wheels which qualify it as a scooter like the Activa. However, the large headlight, telescopic forks, front fender, fuel tank etc. make it a mini motorcycle. We chose not to tag it in a particular segment and move on. Shumi, of course, bills it a scooter. 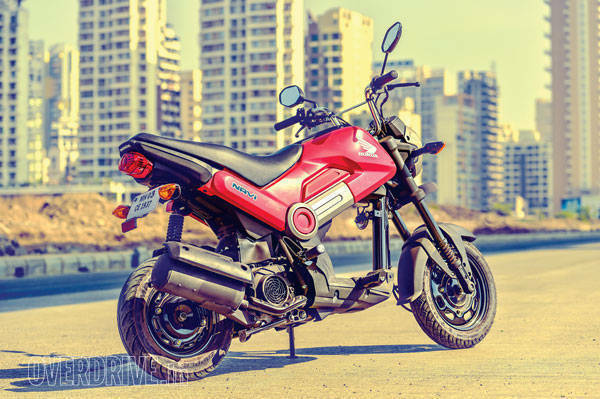 You can read what else he thinks about the Honda Navi here. On seeing me on the Honda Navi, many looked confused. The Navi looks unique because there is nothing on the road which looks even remotely like it. And on top of that someone who looks like he had two Navis for breakfast was riding one. Did he get up from the wrong side of the bed? Did he steal a child's ride? Or has the inflation level reached that high? The adults wondered, and the kids thought they'd seen Ganesha riding a mouse for real. Lijo on the Navi looked like he was riding on the back of his pet rabbit. Poor chap had to fold his elbows and knees beyond normal, and thanks to his tall physique, he ended up sitting on the pillion seat throughout. He too was made fun of, but his expressions were hidden in his chrome-tinted helmet visor. But together, the Navi and Lijo were the perfect embodiment of the saying "Speak softly and carry a big stick", ahem. Both of us were clearly not designed to fit this diminu-mobile and had our share of discomfort. However, we agreed that the Navi doesn't look generic, and that is what makes it so unique and interesting. 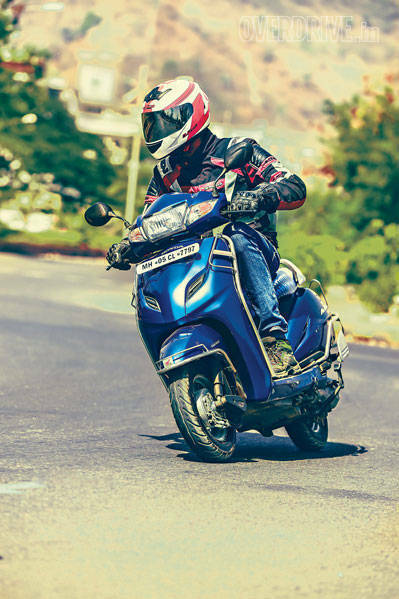 Yes, it doesn't come with the finish and build quality of the Activa and also misses on important bits like a fuel gauge, but its quirky design as well as chunky and muscular lines have an amazing appeal which can't be ignored either. You can search high and wide, erm, and not find anything remotely like it. Both Navi and the Activa are powered by the same 110cc motor that makes 7.94PS. The Navi weighs 7kg less than the Activa which should give it a slight edge. But with that small motor tucked underneath and me on board, will this wheeled mushroom cloud move at all? I am sure that all of you thought the same by looking at these pages. When I went to pick up the Navi from Shumi's place, he stood there till I left his premises. I was praying that the Navi doesn't sound like it was begging for mercy because if it did, I would have been the basis of all his jokes at the office. Nevertheless, I remembered the motive of my brave mission. Cue dramatic music. The first thing that I noticed was that the indicated max speed on the speedo is similar to my actual weight, reality check. And unlike the Navi - which has lost a few kilos along the way (see OD Garage on page 183) - the diet biryani I had last night hadn't worked. I still weighed just as much. I got the 110cc engine hot and bothered and off I rode. To my surprise, the Navi felt properly energetic at lower engine speeds. It's so handy when dealing with frequent stop-go traffic! I clearly wasn't overtaking many but still no complaints as I was enjoying my ride. When I met Lijo, he looked as excited as a tall kid in a toy factory. He almost pushed me off the saddle to ride it. Minutes turned into an hour as I stood beside the Activa guarding it from no one at all, really. Finally, Lijo returned with a gleaming smile, super impressed with the Navi. He wanted this feature to turn into a travelogue. And then into a long termer. Followed by his personal life termer too. Join the queue, buddy. The peppy motor is what got him totally hooked. In addition, he felt that at lower revs, the motor feels more free revving than the Activa. In the city, the Navi is a delight as it is lighter in weight and takes 9.81s to do 0-60kmph while the Activa does it in 10.1s. It doesn't sound like a big difference, but it's a crucial difference. The mid-range performance of the Navi is impressive, but at higher revvs there is a mild drop in the enthusiasm. Just keep the Navi in city limits and you won't be complaining at all. The ride from Shumi's place to mine is a good 20km that takes close to an hour (because it's Mumbai). The first challenge was to dodge various obstacles placed in the narrow lanes. Here you realise what an amazing tool the Navi is as it just slices past everything since it is so easily flickable. And this gave me more confidence to take the Navi on the highway as well. The only difficulty was the peak evening traffic. The Navi's lightweight body and compact dimensions are extremely helpful. The only obstacle that I was facing was my own dimensions. Each time I was between two vehicles, there was a constant scare of me getting stuck. That's me, not the Navi. And no matter how tightly I clinched the 3.8-litre fuel tank, I did end up brushing my knees on some occasions. In Shumi's review, he mentioned that the ride quality is bouncy. Agreed. With his skinny build, he felt more jiggles than what a larger personality like me would feel. The ride didn't seem bouncy to me as the springy suspension was evened out with my personal active counterbalancing. Furthermore, I was having great fun as the front wheel seemed too eager to leave ground over speed breakers. Just give it some stick - that's throttle, not Lijo - and the front wheel is in the air. This particular trait of the Navi also impressed Lijo beyond my wildest imagination. He categorically mentioned how much he loved the tank-straddling stance of the Navi instead of the conventional seating of the Activa as it allowed him to push the Navi around corners at higher speeds. He also had high praises for the Navi's braking, though his lanky physique doesn't need the stopping power of a Hulk which I do. The thumb rule for this is easy to remember. Mo-mentum rises with mo'biryani. That said, the 130mm drum brakes are effective. In fact, I was sorely tempted to pull a stoppie, but with a long look at the speedo's indicated max speed, I decided that conserving momentum was a better plan. At Rs 49,900 (OTR- Mumbai), the Navi is priced Rs 10,600 less than the Activa. It is clearly a no-brainer; the Activa is the safer choice. It has a better resale value and it is highly functional. But the Navi doesn't set out to better those claims. Instead, it proves that a two-wheeler doesn't have to be of a specific size, shape or displacement to be awesome. With quirky and funky lines, the Navi will be timeless except for a few scratches here and there on the easy to scuff body panels. Worst case scenario, if you manage to outgrow it, give it to your kids. In time, you will be the coolest person they have ever known. I had a complete blast riding it all over and recommend that Honda broaden its target audience to have a wider reach. That the current target group is too narrow, and Honda needs to aim higher. Talking of higher, I've got to end this story here and run. Shumi wants the Navi back. Evidently, Bert's asked for it as his long termer! Honda Navi vs Honda Activa: What the funk! 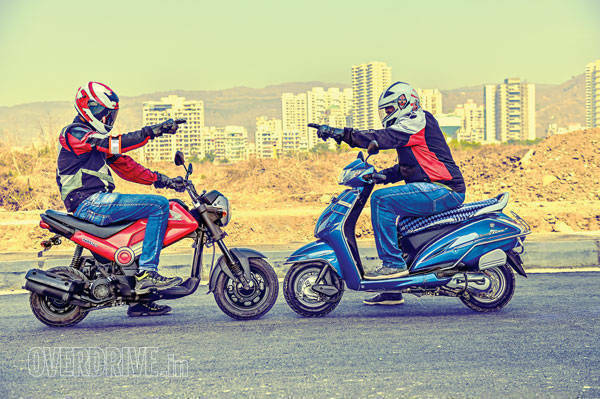 Honda Navi vs Honda Activa: What the funk!